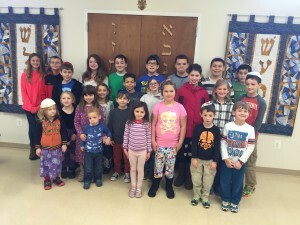 The Sha’are Shalom Sunday School was established to teach the young people of the congregation about Jewish traditions, holidays, culture and values, as well as Hebrew for religious services. It is a place where Jewish children can gather with others with similar backgrounds. This is particularly important in an area such as Southern Maryland where Jews are widely dispersed. Classes are currently available for students ages 3 through 13. Parent volunteers conduct classes. Family Service: Each Sunday School session starts at 9:30 AM with a service for all students and their families. The family service familiarizes students with regular Shabbat services and gives them a chance to practice their Hebrew skills in a friendly setting. A child’s version of each week’s Torah portion is read and discussed. Services are led by parent volunteers or Bar/Bat Mitzvah students. Pre-K & Kindergarten: These classes emphasize fun activities such as crafts, songs, games, and videos. The activities are designed to introduce students to the Hebrew alphabet, holiday traditions, Bible stories and Jewish culture, and to reinforce positive values. Primary I: Students in this class learn to read and write the letters in the Hebrew alphabet. They begin to read basic Hebrew words. The students continue to learn about Jewish holidays and culture and about Israel. They sing songs, make Jewish-themed crafts, and read and discuss Bible stories. Primary II: This class continues to learn how to read Hebrew. Time is also spent on other activities such as learning about events in the life of a Jewish person. Jewish holidays and traditions are also discussed. Secondary I: This class continues to learn how to read Hebrew. Time is also spent on activities such as discussing G-d and the various types of Judaism. Secondary II: At this age, students begin to focus more intensively on preparations for their Bar and Bat Mitzvahs and on their future adult roles in religious services. They spend significant time studying the weekly Torah and Haftarah portions. Advanced students have the opportunity to plan and lead the family service. Students within a year of their Bar/Bat Mitzvahs also have monthly preparatory classes with the para-rabbi. Music Instruction: All classes have sessions with the music instructor on a rotating basis. Every few weeks the classes join together for a music session.